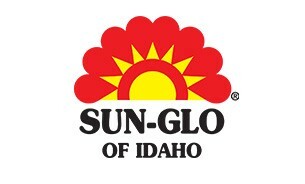 Sterman Masser Potato Farms - Sun-Glo of Idaho, Inc.
Sun-Glo of Idaho, Inc. is a fourth generation, family-owned grower, packer and shipper of premium quality fresh Idaho® Russet Burbank potatoes, with state of the art facilities and sales operations in Sugar City, Idaho. Located at the base of the Teton mountain range, the Crapo family grows the highest quality potatoes that Idaho has to offer by combining generations of knowledge, modern technology, and old fashioned hard work. Sun-Glo markets potatoes under the Sun Supreme, Martha's Garden, and Ace brands, and also distributes Idaho-grown onions under the Sun Supreme brand. The Crapo Family grows their own seed potatoes, which they then use to plant their crop. This helps insure superior quality control from field to fork and a delicious eating experience for the consumer.